Productivity Suites Archives - Joxicraft - Internet and Telecommunications Leader! Office Online makes it easy to work with other people on the same document, at the same time. You can see changes being made to your document as they happen, right on your screen. This keeps everybody in sync as ideas develop. Office Online is free – there is nothing to install, buy, or download. Everyone can work together on the same document, whether they’re working on a PC or Mac or even a compatible tablet, as long as they have Internet access. Your document is automatically saved to OneDrive while people edit. Just click Share in the toolbar above your document to invite others to work along with you. Microsoft is drastically expanding the amount of cloud storage available to both its OneDrive users (formerly SkyDrive), and Office 365 software suite: from 7GB to 15GB, and from 25GB to 1TB respectively. The changes are likely made to increase awareness of Office 365, and slated to take effect some time next month (today 5 August). If you want to synchronize data across multiple devices for free, this is a great opportunity to experiment with cloud-based storage. Typical usage includes data backup and sharing documents or pictures. Microsoft OneDrive is available to the general public (for free), so long as you have a Microsoft Live account. On the other hand, Office 365 is a subscription-based software package, which is essentially a mobile version of Microsoft Office. 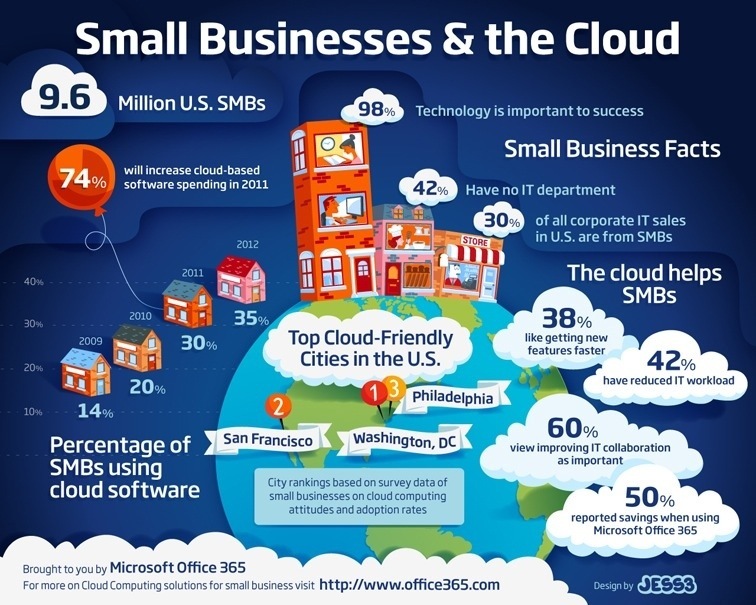 The increase in storage for Office 365 could have a dramatic impact on the number of people subscribing to Office 365, a web-based software package that adds cloud integration to Microsoft’s traditional Office suite. Like the standard Office package, Office 365 offers users access to business programs like Word, Excel, and PowerPoint. One major difference is that files created using Office 365 are automatically backed up to Microsoft’s cloud storage service, OneDrive. Now, Office 365 Home users who typically pay $9.99 per month for their subscription will get 1TB per person, with up to five people being able to create their own accounts. The deal is also available to Office 365 University subscribers, who pay just $79.99 for a four-year subscription. Microsoft says current and new Office 365 users won’t need to make any changes; they’ll see their storage ceiling increase by next month. To access OneDrive, you first need to have a Microsoft Live account (free). Users can then access the OneDrive free cloud storage by either visiting the OneDrive website directly or by installing the OneDrive app on their PC or mobile devices (supported are: iOS, Android, Windows Phone, Xbox, and Windows Tablet). The benefit of installing the app (even on a PC) is that it allows for seamless operation. For example: you can access OneDrive services like it was a folder on your desktop, rather than having to login to the OneDrive website in order to upload a file. You can then share the same file across multiple devices simultaneously as it will be accessible on cloud storage. You can download OneDrive for Windows Vista, 7 and 8 Microsoft’s site, and there’s also separate instructions for OneDrive for Windows 8.1. Most industry analysts say the move should increase the popularity of Office 365, leading more people to purchase subscriptions. Still, experts say the move is less likely to hurt Google, one of Microsoft’s most significant competitors, than smaller cloud storage companies like Dropbox and Box. These firms simply don’t have the capital or market presence to compete with Microsoft if it’s going to offer users such a large amount of storage at little to no cost. Does this deal make the Office 365 software package more attractive to you, or are you just as happy using an older version of Microsoft Office (or perhaps an alternative office suite)? Do you currently use Office 365, and if so, how do you think it compares to previous versions of Microsoft Office? Do you think cloud storage is an imperative feature for office suites in today’s market, or do you think Microsoft is simply following Google’s lead? Have you tried using Microsoft OneDrive to synchronize data across multiple devices? If so, what was your experience? 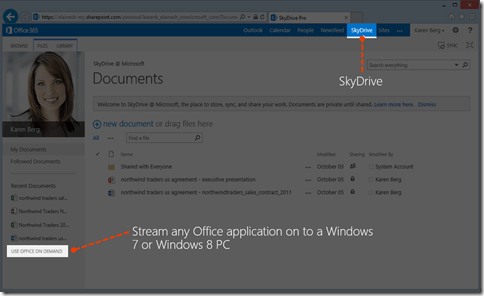 Use your Microsoft ID to stream copies of your Office apps to other PCs (Windows 7 or Windows 8). Log into the Office website to use Office on Demand. Having the ability to install and use Office 365 ProPlus on multiple devices, in browser capabilities with Office Web Apps and mobile features with Office Mobile are all great. However, you may need the full Office experience when you don’t have your devices with you. 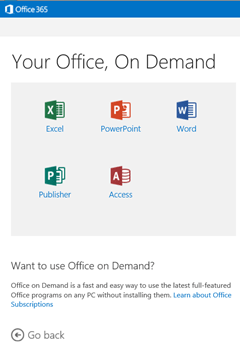 With Office On Demand, you can stream Office applications to any internet connected Windows 7 or Windows 8 device. No installation is required and you don’t even need the admin rights on the device. Since the application is not installed on that device, it can run side-by-side with an older version of Office and when closed, it will leave no trace behind. With Office 365, regardless of the device, you will always have the best experience and you can be productive anytime anywhere. Keep in mind, you can purchase your Office 365 plan subscriptions via OPEN licensing, like other Microsoft licenses. Please connect with Joxicraft your local Microsoft Partner to see your purchasing options, try Office 365 and start enjoying the benefits. A good morning to all our Joxicraft followers, this week and the coming up one we will dedicate to exploring the new features found in the new Microsoft Office 2013 compliments of TechRadar website. Whether you’ve bought the apps as one-offs, the whole Office 2013 suite or signed up for Microsoft’s new Office 365 subscription package, there’s lots to like about the new versions of Word, Excel, PowerPoint and Outlook. If you’ve taken the plunge with the new-look touch-friendly apps, these tips and tricks can help you go further with the software – from tailoring the interface to embedding online clips, there’s plenty to explore. We will focus on the new features in Office 2013 (though you will find some tricks that work across the board), while providing a mix of quick hints and more in-depth tips to suit every level of user. Prepare another entry into your File Of No Surprise: Microsoft is moving ahead with its efforts to bring the highly lucrative Office franchise to Android tablets. According to The Verge, Microsoft is currently prepping a private beta of the new software. A sign-up page has been mostly taken offline since the news broke. A full Office suite for Android tablets is roughly as surprising as San Francisco morning fog. Microsoft confirmed that it was building the native suite earlier this year, and rumor followed that the Android apps would beat a touch-first build of Office for Windows out of the gate. To see Microsoft begin to ramp up testing is hardly surprising. Office for iPad has been a material success for Microsoft. Despite some market doubt that the apps were too late to make an impact, or that users wouldn’t use them due to Office 365-related restrictions, Microsoft’s latest sally into iOS has gone well. Android may be no different. The mystery that I can’t unravel is why touch Office for Windows tablets is so damned late. The above is merely another plank in the current Microsoft effort to have its corporate focus be both mobile-first, and cloud-first. Office, of course, is now heavily based on OneDrive, Microsoft’s cloud storage service. What will be interesting to gauge is market response to Office for Android, measuring if it can match the prior response to the iOS suite. Microsoft saw 27 million downloads of its iOS Office apps in 46 days. Now, keep in mind that this number only accounts for direct downloads of the free versions of Excel, Word and PowerPoint—not actual paying customers. In April Microsoft said that it only had around 4.4 million paid Office for iPad subscribers, so it’s tough to tell in what capacity the remaining 23 million downloads are being used. But regardless of how you slice it, the number is a good sign for Microsoft. It essentially proves that despite being years late, Office—the company’s largest money-maker—can still see some success on the iPad. A quick look at the App Store shows that Word is still in the top 5 free iPad apps, and both Excel and PowerPoint are top 30. If you haven’t checked them out yet, you can find Word, Excel and PowerPoint in the App Store. OneNote as well.